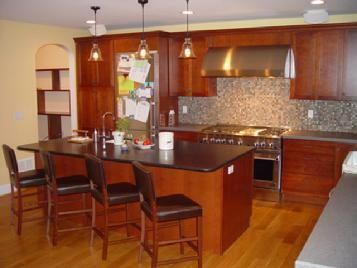 Talk about kitchen envy, this project was extensive. This two car garage conversion into a kitchen is, to this day, my proudest job. The pictures do not truly capture the essence of this work. 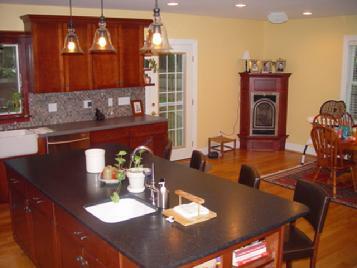 We extended the front of the old garage out 4 feet and framed up off the garage floor 18 inches and even raised the ceiling to create a 17'x24' gourmet, eat-in kitchen with farm sink, high-end appliances & gas fireplace. We relocated the 1/2 bath. We enlarged the dining room from 12'x14' to 12'x26'. 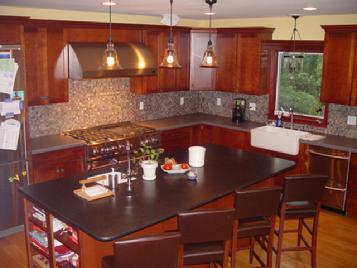 The black granite island has a 12" overhang for stools and the island bar sink makes clean-up easy. The fieldstone backsplash ties the whole kitchen together. We custom built arched entrances and created a naturally functioning figure 8 circular pattern that allows for free, easy motion. The finished product can not be distinguished from the original construction as we took care to match existing period mouldings.